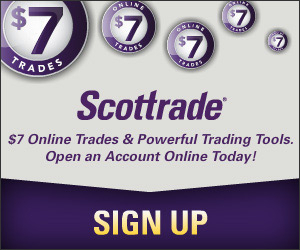 Scottrade is a low-cost discount broker that lets you trade stocks and ETFs for $7 commission. In addition to ETFs from other firms, Scottrade offers investors its own FocusShares ETFs that are completely commission free for Scottrade customers. The ETFs cover both the broad market and specific sectors for investors to build their diversified investment portfolio. Open an Scottrade account with promo code KGKP0724, receive 3 commission free trades and start to invest in Scottrade ETFs without commission. Update: Last week I wrote about how you can buy ETFs without paying any commission and in the article, I listed Scottrade as one of the brokers which currently offers commission-free ETFs to its customers. The information I had in the article about Scottrade ETFs was from the March 2011 Scottrade announcement when those commission-free ETFs were first launched. Even though I am a Scottrade customer (thus the email from March 2011, I don’t own any of those commission-free ETFs, thus I am not entirely clear about the current status of those ETFs. And I am wrong assuming they are still available. The Board considered current market conditions, the inability of the Funds to attract significant market interest since their inception, and their future viability as well as prospects for growth in the Funds’ assets in the foreseeable future. The Board determined that it was advisable and in the best interests of the Funds and their shareholders to liquidate the Funds, which are listed for trading on NYSE Arca. Somehow, I missed the announcement and I didn’t think I got any email communication either. Anyway, it was quite shocking to learn all the funds were shut down after such a short period of time, I wasn’t that surprised by the “news”. Unlike other brokers listed my commission-free ETFs table, Scottrade took a different approach by offering its customers totally new ETFs created just for Scottrade while others worked with major ETF providers, such as Vanguard, iShares, State Street, and PowerShares, to offer funds that have been around for a while. Given the pace the ETFs have expanded in recent years, it’s not difficult to see why Scottrade, and FocusFuns, isn’t alone in closing funds that have failed to attract any interests among investors. After all, there are so many choices already in the ETF arena and it’s very easy to find one popular ETF in every asset category to build a well diversified all-ETF portfolio. That said, I still hope that Scottrade will, like other brokers, work with existing major players in the ETF industry to offer its customers no cost exchange-traded funds. The following was part of the original article published in March 2011. The news that Scottrade was preparing to offer its own low cost Exchange-Traded Funds (ETFs) has been out for some time. Yesterday, the popular online discount broker announced investors can now trade a suite of FocusShares Scottrade ETFs that currently consists of 15 diversified funds, all tracking indices developed by Morningstar and all with the lowest expense ratio (ER) in their respective category, ranging from 0.05% to 0.19%. The ERs were even lower than Vanguard ETFs, which are pretty much the benchmarks of the industry when it comes the costs of investing in ETFs, as well as mutual funds. The new Scottrade ETFs and their ERs are listed below. To give you a sense how low the Scottrade ETF ERs are, here’s a comparison chart of ERs of funds from some larger and more popular ETF issuers, including Vanguard, iShares, and SPDR. For example, Scottrade US Market Index ETF (FMU) has an ER of 0.05%. In the same category, Vanguard Total Stock Market ETF (VTI)’s expense ratio is 0.07% while iShares Dow Jones U.S. Total Market Index Fund (IYY) has an ER at 0.20%. As you can see, the Scottrade Focus ETFs definitely look attractive to cost savvy investors who always keep an eye on the cost of owning a fund in the long term. However, as you also may know, cost isn’t the only consideration when it comes selecting which ETF to invest in. There are also tracking errors and ETF trade spreads to consider. I am not very familiar with Morningstar indices, but I assume that they are relative new and not widely used as other indices, for example, MSCI indices. Therefore, even for funds that target the same sector such as the broker, their performances could be different because their underlying indices are constructed differently. As for the ETF spreds, since all these Scottrade ETFs are new, their trading volumes will be low, especially at the beginning. This could lead to wider bid/ask spread because the new Scottrade ETFs are not as liquid as those ETFs with large daily trading volumes. For investors, a wider spread means additional cost of actually owning the fund, in addition to the obvious costs such as ER and commission. Speaking of the total cost, the good news is that if you are a Scottrade customer, you can buy and sell all these Scottrade ETFs for free. It seems to have become a trend since 2009 that, as ETFs are getting more and more attentions from investors (the total number of ETFs offered recently passed 1,000), brokerage firms began to offer them free of commission charges to their customers. So far we got Charles Schwab, Vanguard, Fidelity, and TD Ameritrade, all having a number of commission-free ETFs, either their own funds or from third parties. Now that Scottrade has joined the party with their own low-cost ETFs, the competition just got heated up a notch again, which is good because now we have more choices to trade ETFs for free. If you are not familiar with Scottrade, you can read more about the broker in my Scottrade review post. For investing in ETFs, I also have a post on how to buy ETFs, with information on free ETF offers from other brokers.